Swisscom is now offering a new M2M-based (machine-to-machine) fleet telematics solution, which will allow customers to optimally manage their vehicles and reduce both fuel consumption and CO2 emissions, among other benefits. Swisscom is expanding its range of M2M solutions and will now operate in Switzerland as the exclusive partner of Masternaut – Europe’s largest provider of telematics solutions. The telematics box in each vehicle transmits vehicle data, such as location, direction, speed or fuel consumption, in real time over the mobile network to the central platform. This makes it possible to respond swiftly to customer needs or external circumstances such as accidents or traffic jams. Drivers also stand to benefit, as the solution helps them to drive in a cost-effective manner and promotes safer driving. For example, they receive visual and audible signals as soon as pre-configured threshold values relating to rapid acceleration, sudden breaking or sharp turns are exceeded. 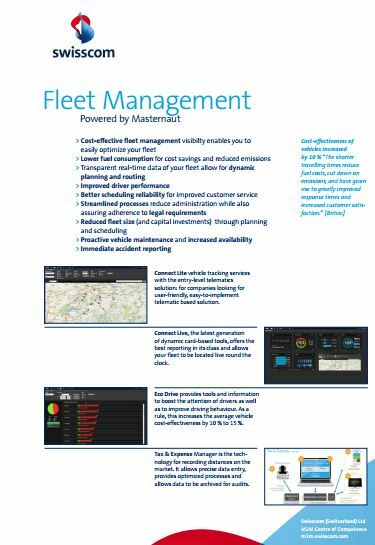 Having that in-depth visibility of a fleet gives a plethora of data that helps to reduce accidents, speeding, harsh braking and vehicle idling. All this coming together has the added benefits of cost savings, in the form of fuel saved as a result of more economical driving. 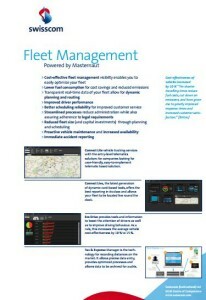 These are services that are beyond the traditional vehicle tracking technology and demonstrate the broader reach. Education through driver training should be central to creating a safer mobile workforce for any employer. The benefits are clear for all to see and the intelligent application of telematics is central to giving drivers the best possible feedback and training.